Now in open beta, Nuke 11.0 is the next major release of the industry’s leading high end compositor. This new release focuses on collaboration and just how people can use the product. 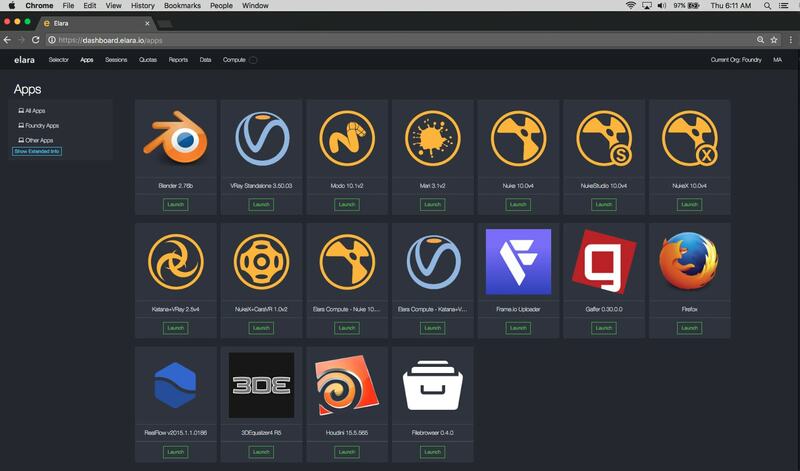 NUKE remains the biggest product in the Foundry, while Katana and other products have been growing swiftly especially in the last 12 months, NUKE remains the biggest product in the company's lineup. "The growth has been really rock solid and if NUKE is indicative of the Industry as a whole, then clearly things have been going quite well" commented CTO and Foundry co-founder Simon Robinson. The product customer mix remains fairly unchanged, but how the product is used has been evolving and this new release captures much of that evolution. What is Nuke these days? In early March a press release came out from Chaos Group stating that "V-Ray 3.5 for NUKE is the first ray traced renderer that can render volume simulations directly in NUKE. Used on films like "Spectre" and "The Revenant", V-Ray for NUKE is also getting a major upgrade to its deep rendering tools, making deep compositing that much easier." This latest version of V-Ray allowed "V-Ray’s Academy Award winning ray traced renderer in NUKE’s industry standard compositing application gives artists the best of both worlds." Given that this allowed for complex volumetric Deep Comp ray traced rendering... what is Nuke these days? The notion of a compositing box rendering raytraced deep data would have made no sense just a few short years ago. The term 'compositor' or '2D box' no longer seems like an adequate description. We asked Simon Robinson, co-founder of the Foundry. 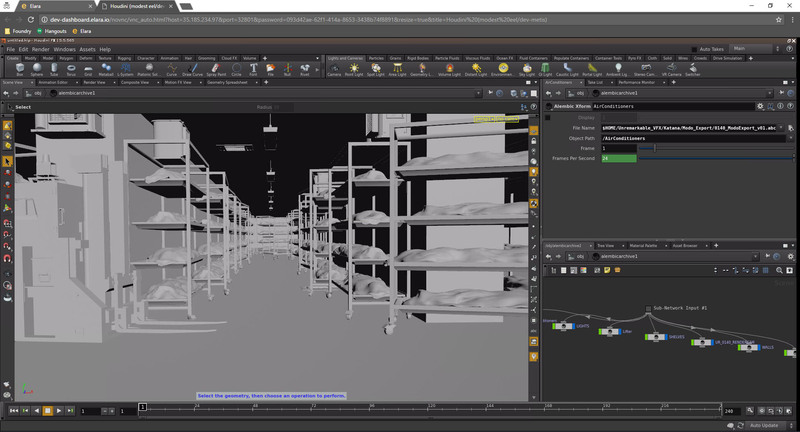 "Yes it has shifted, and it is as much the nature of the industry as the Nature of Nuke,..ten years ago we would have said this is a compositing system with some 3D in it and today it is very much more a HUB where things are brought together,.. and so clearly there are some things done 'live' hence V-Ray for example". The notion of Nuke as a place where things come together compared to being a compositing station will ring true for many artists. But while 3D has evolved very much into a pipeline of collaborative teamwork, Nuke still seems very much like a HUB that is built on the legacy assumption that one artist would put together one shot. "What has crept up on us is the amount of compositing vs. anything else that goes on the pipeline. The proportion of what is done on Nuke seems to have expanded dramatically", adds Robinson. "A Hub or platform - a place where people put things,...". While the defining feature of Nuke is that it is not the source of originating material in the way 3D or on set live action certainly is, still there remains the problem of assuming just one person will pull it together per shot. Apart from some roto or tracking work, the primary model for Nuke use has been one person on what Robinson calls "the hub" pulling things together. 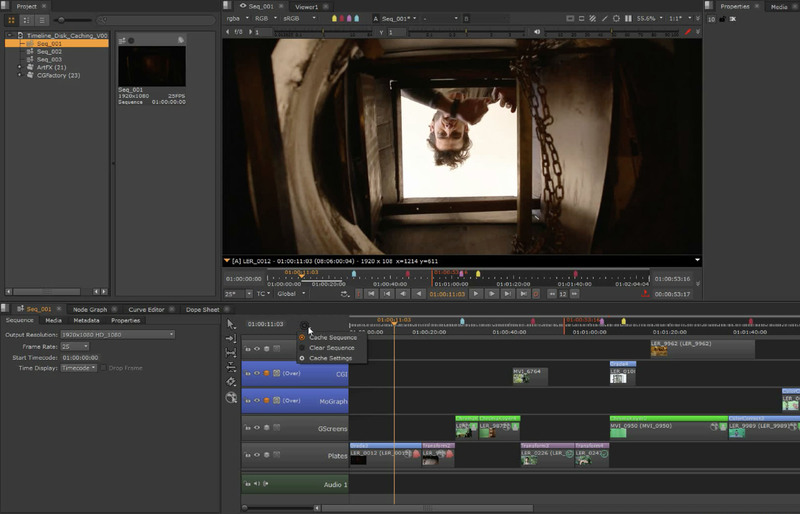 While larger customers have been breaking down shots so that multiple compositors can work on the same shot, the Foundry have two immediate solutions to make this easier; LiveGroups and Cloud use. 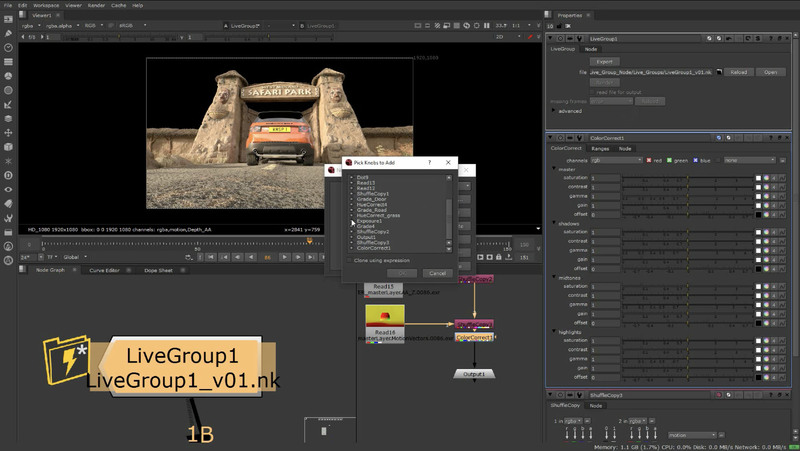 This central issue of collaboration and new team based workflow is addressed in Nuke 11 with LiveGroups. Nuke has for a long time been able to take a section of the composite tree and group it, collapse it or possible make it a Gizmo with some subset of parameters visible in the main tree. "LiveGroups are like that except that they live separately on disk and they are versioned separately". This allows an artist to take a comp problem and "chunk it down into discreet groups, and anybody who has that comp can work on those groups independently" and all other people who inherit that comp have version control of adding the new work back into their current composite. "Everyone can choose to get all those updates anytime they reload the comp" he adds. The versioning is key to this process. Without the versioning, people could step on each others saved master file, and also people would face the comp changing under them without their explicit approval. Unlike google docs, a compositor can not have a sub tree or group change as the flow of the sequence could break and the system would be unworkable. Not only does this allow a team to jointly work in an orderly fashion on the same comp, but it opens up a much easier way of having teams at different locations working together. It extends the work practices of 'pre-comps' into a robust collaborative model. 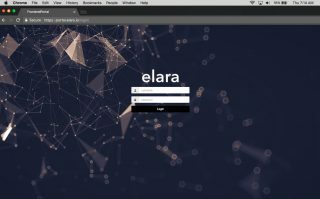 The second major aspect of new workflows highlighted by the introduction is the cloud based Elara. 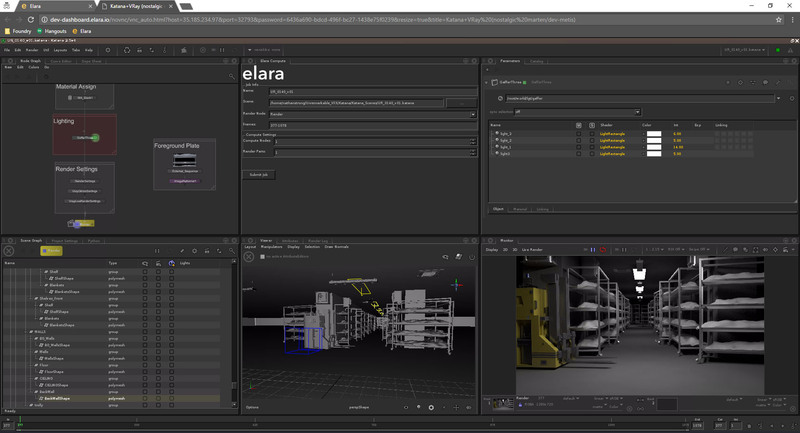 Foundry also introduces Elara; a cloud-based service for post-production that centralises infrastructure, creative tools and pipeline. Now you can access everything you need via their web browser, including Foundry and third-party applications, integrated cloud rendering, scalable storage and compute. Elara, which has been worked on for almost three years, allows everything to run in the cloud, which means the Foundry is focused not just on NUKE but a complete pipeline of tools running via a web browser. "It contains a complete pipeline containing many of the standard pipeline elements you'd expect including render management but also any of the applications that are installed on the platform, NUKE is of course, one of them" Robinson explains. At NAB the team will be showing a small project running not just Nuke Studio but Katana, Houdini, and V-Ray all working together. This allows The Foundry to demonstrate how a global team can set up a virtual studio, complete with central pipeline, storage and resources "in a few clicks, without worrying about a high upfront investment or management complex". Robinson feels there is an inevitability about the industry moving to this approach. "I think there is a lot of 'stickiness' to working this way, but there are some real questions about how quickly we move and what might slow down such a move such as 'is the infrastructure we work with good enough to use and of course a lot of companies have invested in a lot of Capital expenditure already". Still he feels that is is vital for the Foundry to offer these solutions and work with customers to explore how they might migrate to such a virtual environment. At the moment The Foundry is less focused on replacing vast installations as they are offering smaller teams the flexibility and scalability that Elara can provide. It allows not only equipment advantages but collaboration advantages "I think Elara fit the bill quite well, for those users, although it is equally able to be used on large scale, or as a hybrid .. once you virtual pipeline we think of it living somewhere like Google (Cloud), but to be honest it could also exist not on the cloud, but on a rack in a facility, and you would manage who has access to what apps, by virtualizing it at the server end". In this case the advantage is not using someone else's hardware, but managing and using your own hardware better. One advantage of this for the Foundry is that the company has had to move from selling apps that run in someone else's pipeline to having to build the pipelines themselves. The company now has in house pipeline experts that day to day build working production pipelines. This opens the door to the Foundry possibly expanding into more 'services' model where the team run the platform. "Elara presents the opportunity for us to offer a live service like that, and it is an interesting more for us as it isn't just about our applications but in is around other people's applications as well, and that is fun! ", Robinson comments. Elara is cloud agnostic and is not locked to any one cloud provider. "One of the surprising things when talking to our customers is how much they already bust their infrastructure onto the cloud today", he explains. The Foundry recently ran a small event in London for CTOs and it was "surprising how many, daily - as part of their business burst their capacity onto the cloud - mainly for 3D - just to meet demand and be flexible". While this is now more common than not, "they don't make a big song and dance about it, I think this way of working is just creeping up on the industry as a standard solution, which is why, I think what we are doing is timely". Both Elara and NUKE 11 moves such as LiveGroup show the broadening of the product line and the approach to working both with clients and how clients work internally. The agenda of what NUKE is exploring moving forward is a balance of customer requests and exploring new technology in areas such as VR. "These days we can make pretty much any damn picture we like, so it is no longer an issue of can you give me something neat that gives me a newer picture, this is about doing stuff more efficiently. But it is also about future research into workflows that we really can't predict" says Robinson. Google unveiled their newest virtual reality (VR) camera at NAB. The Yi Halo will sell for $17,000. 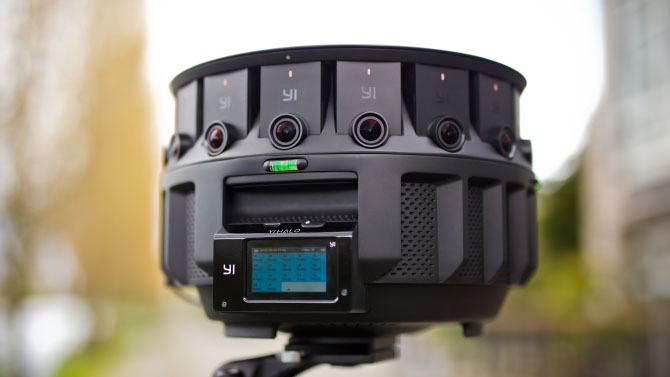 It is closely tied to Google’s Jump system, a cloud-based stitching solution that aims to take manual intervention out of producing stereoscopic 360-degree videos.The camera combines 16 spherically aligned 4K action cameras with an extra camera facing upwards. Cara continues to move forward also, the Foundry are firmly looking at how to address Lightfields and "taking in dense data from places like Google Jump", says Robinson. We are moving beyond flat rectilinear information which is how we thought of compositing in the past, to very dense data in new formats". Looking forward in this fast moving part of the market, Robinson is a huge advocate of research into Lightfields "In the team I am always going on about Lightfields research, .. in the sense that there is a future in there somewhere, where the kind of data we put together is very different from the kind of flat data that we put together today, and so we are already thinking about that, without knowing when that will be, what formats or who will exactly need it, but we are definitely thinking about richer data sets". Yi Halo - part of Google's JUMP strategy that the Foundry is closely targeting. Someone knows how we can test Elara ?